I recently made an interesting discovery. I like my science fiction with a tinge of science fantasy, specifically of the pulp visual nature, prevalent in American culture from about the 40s to the 70s historically. So I’ve been slowly pursuing a project you can see on the bottom right, under the heading “Science Fiction Bar Fight along the lines of the Draco Tavern” (Classic Niven Reference for the win). I’ve posted on my retro SF efforts in the past on here. Given the long winter of being homeless (see the post about the tree), I’ve had time to paint and have stuff painted. My collection has grown dramatically. 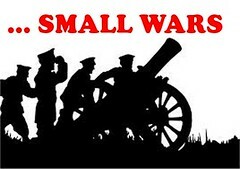 Alas, as the Wargame Supply Dump has gone out of business I have jumped in and attempted to buy as much of his line as I can before it vanishes. A lot of the current offerings in 28mm don’t have the exact right “fantastic feel” to them.. just a tinge of silliness and whimsy, like Buck Rogers and Flash Gordon. Like fins and bright colors and big oversized ray guns and and goggles and leather helmets and such. I’m always looking for figures like this– I’ve been buying and painting GAFDOZ for years and recently made the aforementioned binge buy of WSD before it folded tents. The problem is where do you go from here? That’s what this post is about. 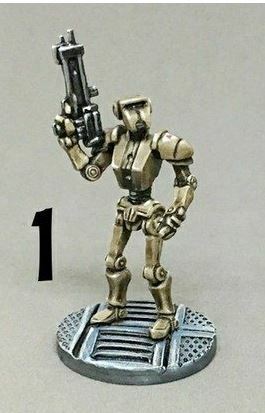 Will it be possible to find more 28mm figures with the proper wacky pulp retro look and feel? Well, yes, but I’ll have to go about it judiciously. One element of the amorphous “pulp SF universe” that I feel is is important is robots. I mean the big rounded edged clanky guys you used to see in the old serials. I found some candidates that make perfect sense in this setting. 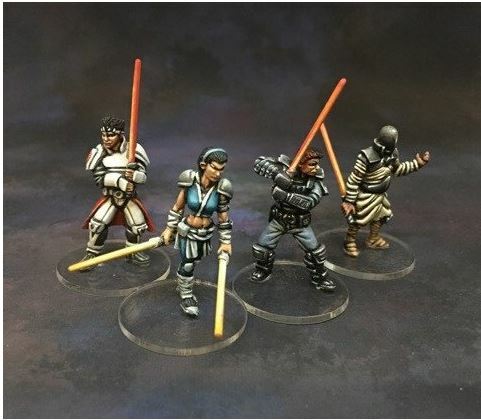 I discovered Brother Vinni, a 28mm figure manufacturer who specializes in resin cast Science Fiction, Fantasy and Historical figures. I believe? the manufacturer is from Russia. I really like Brother’ Vinni’s small SF Line, particularly the “Nuclear Sandlot” category. The humanoid figures tend to be more slender than the figures I have to compare them to– mostly in the GAFDOZ range, which are “beefy”. However, robots don’t have to be in any specific scale, even androids. One assumes there will be a variance. The Nuclear Sandlot robots appear to be sculpted with an eye towards the FALLOUT computer game. If you’ve played it, you’ll see what I’m talking about. I picked up the Flying Bot figure which looks like the robot major domo figure from the game. It’s easy to put together. You’ll have to do some standard prep actions before painting– soak in water overnight, and be sure to drill the hole out a little. The figure doesn’t come with a stand, per se, but does come with a transparent peg to mount on a stand of your choice. Here is my version, after cleaning, drilling and mounting on a MDF circular base. Good choice, actually– this model can get a little top heavy and you’ll want something heavier to keep it upright. I ended up painting the robot a gun metal color overall, with some bronze highlights, a bronze colored security weapon and bright red lenses on the security camera arms and main ray gun face. I gave it a sort of thinned out black ink to give it a little grime and depth, and a couple of coats of medium shiny sealer– I’m giving all the pulp stuff a shiny coat because it seems to fit the subject. Same approach to cleaning, drilling and mounting. 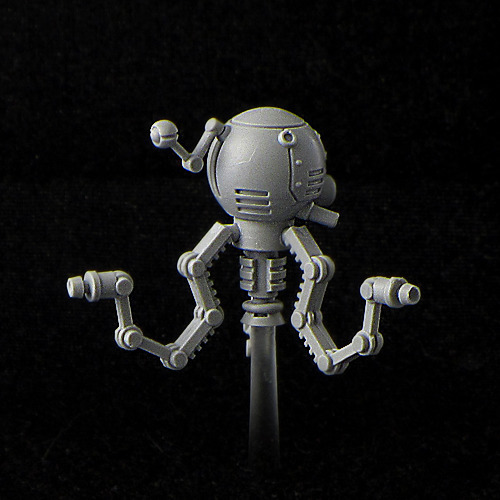 The observer bot has a little whip antenna that has to be attached, be careful, this will get away from you. 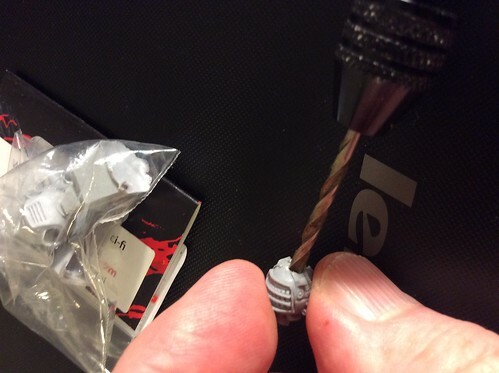 The hole for the stand up flight pole was totally filled in with resin so I had to drill it out carefully. The model has holes in it for some sort of whisker antennas (four of them) but these were not included. 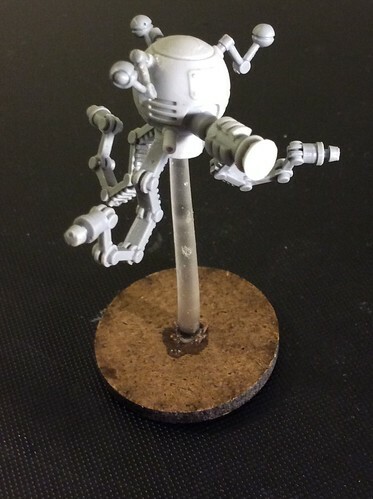 I suppose someone could heat up a piece of sprue to stretch out and make them from scratch, but I didn’t see the point of it. That’s my only complaint about Brother Vinnie’s kits.. don’t advertise an element of a model in the assembled pictures that isn’t provided in the final product! Last robot I got is ALSO inspired by FallOut, I think. It matches one of the standard robot types found in the game, and Uncle Vinnie just calls this “Robot“. This was probably the easiest figure to clean up, assemble and paint. 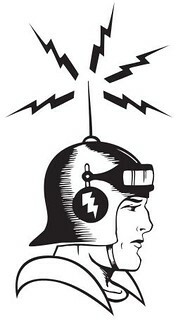 The overall aesthetic is kind of like a pint-sized Robbie the robot character from Forbidden Planet. He’s going to make a decent robot butler or some other kind of servant. I also mounted him on MDF, painted an overall gun metal with bronze highlights, and gave him a little grime (thinned black ink) and a semi-gloss coat like the robots above. “Robot” fits in well with the pulp figures I already have, being somewhat tiny but then again, who says robots have to be huge hulking figures to be useful? Nobody, that’s who. Now, on to some figures that I loved, loved, loved in the adverts, but the reality was kind of a mixed bag. At least you have the bottom line up front. 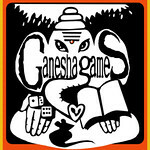 On to Ganesha Games 28mm Science Fiction line, being manufactured and distributed Alternative Armies. 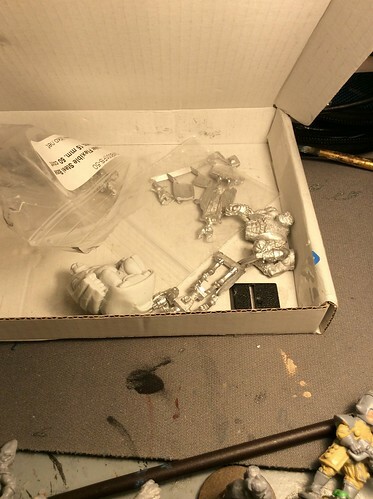 I was very intrigued by the latest releases that were recently trumpeted on the Alternative Armies website about Lord Phalag and his companions, Psi-Knights and Combot combat robots. Lord Phalag is a Baron Harkonnen looking chap in a floating chair, looking very corrupt and dissolute, and slightly evil. He has an enforcer brute companion named Graul Granite who reminds me of the Thing from Fantastic Four, and some female alien type modeled to look like she has some form of psychic power or whatnot named Skarra. I was in as soon as I saw the floating chair. Now that’s a great sculpt. Very decadent looking. Well, I had to have those guys, too. I was pleased that Alternative Armies will through in a “Combot” robot with each purchase from this line and got one of those, too. Now, here’s the rub. These are beautiful sculpts.. very pulpy, nice detail. I want to build and paint these. This is what showed up at my door. No instructions. No bases. Nothing. Just kind of a jumble of parts. The feet aren’t even attached to a slot to go on a slotta style base. Nothing. The figure of Lord Phalag is my favorite, but I’m going to have to figure out how to put this thing together. Worse, I’m going to have to figure out the flying base too.. I know there are companies that sell these, but apparently Ganesha is not one of those. So how do I base them? (BTW, the website DOES say “sold without bases”.. and it’s my fault for jumping on this without reading, I admit that up front, but I wanted this thing to work.. and thus enthusiasm overcame common sense). Well, it’s going to take a lot of work to make these figures work. I suppose I’ll have to find some slotta bases (I don’t have any). The figures are cast without anything at all on their feet so I expect I’ll have to drill and pin to make the figures stable on a base of any kind. 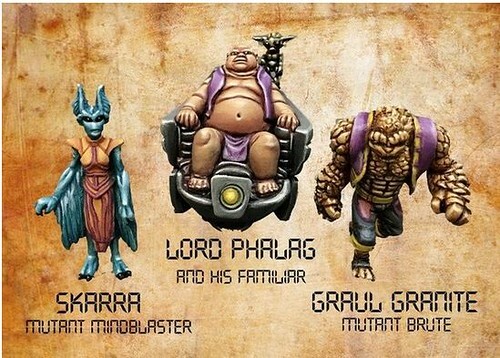 The Chair figure of Lord Phalag is the big disappointment. I’ll have to buy a flying base of some kind (no idea what will work, they don’t say and they don’t sell one) and the resin part is pretty smooth. There’s some metal bits to finish out the figure but the resin is so smooth something tells me I’ll be drilling and pinning there as well. I’ll make it work but it won’t be a fast process. In summary, it’s a mixed bag. I like the sculpts and detailing of everything I’ve purchased lately, but the Brother Vinnie models came together significantly more easily than the Ganesha Games stuff will. Everything seems to fit well with other pulp figures I already have, so I’m pleased, but grumpy about all the work I’ll have to do for the Ganesha stuff. Hi Walt, if you need help with the basing get them to me (Chort/John Montrie has returned from Hong Kong and if you are meeting with him any time soon or if you want to bring the “to be assembled” lot to Historicon) I will get them based flying or on the ground as needed. I maintain bags of bases in my work kit, think I’ve got what you need, and if they are to be painted by Chort and Virginia I see them every week so I can deliver the assembled minis to them. The only thing I need to is if you know the proper washing technique for any resin components it would help if they were cleansed so I can drill, glue/mount and prime them. 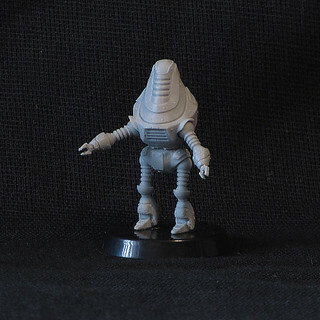 More SF : I don’t know if you are familiar with Old Glory’s Blue Moon space miniatures, they have one pack of classic 1950s EC comics bubble helmeted space men and one pack of Rocket men with Commando Cody type removeable helmets. Check out Black Cat Bases in the UK, you really have to wander all through all their ranges and search out what they have. All available Robots do not appear in a search for robots, there are others hidden in the other lines. My son Brendan got a Robbie the Robot from them but it looks like that one has been pulled as well as pieces that could be assembled to look like K-9 from Doctor Who. Cthulhu series has all different periods of dress mixed through the line but I’m sure you’ll want a Miss Scarlett for your spy game. 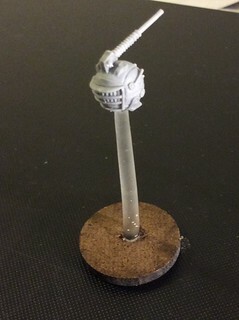 I use the brain in a jar on treads for my Gaslight VSF game. Let me know, Ed (And now back to the British baking show and painting Test of Honor Samurai, see you at H-Con).